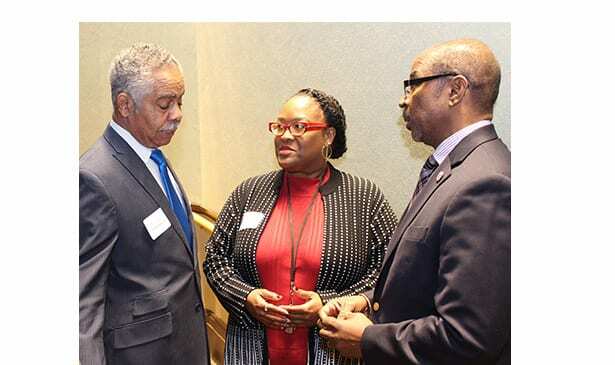 NASHVILLE, TN — Community and businesses leaders advocate an on-line voter registration campaign launched recently by two elected officials looking to reverse two trends; declining voter registration and lower voting rates. The time and place to launch Project Register are remarkable. U.S. Rep. Jim Cooper and Tennessee Sen. Steve Dickerson announced the campaign on Alabama’s election day when, in a surge of minority voting, Doug Jones was elected to the U.S. Senate instead of Roy Moore. Meanwhile, in this 14-county Metropolitan Statistical Area, “roughly 70 people were added to the Nashville MSA’s population each day through net migration in 2016,” says Riley Scholer, the Nashville Area Chamber of Commerce’s analytics and applied research manager, quoting U.S. Census Population Estimates. So, there are plenty of people to register. 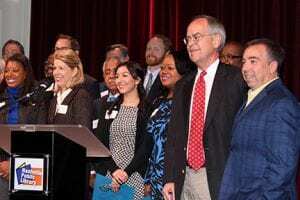 U.S. Rep. Jim Cooper, third from right, stands with, front row from left, Nashville Area Chamber Policy Vice President Michelle Gaskin Brown, Ascend Federal Credit Union President Caren Gabriel, Fisk University professor Dr. Reavis Mitchell, Conexión Américas policy manager Karla Coleman Garcia, Randstad Senior Vice President Laquita Stribling, Cooper, and Nashville Predators CEO Sean Henry. Ranked 40th in voter registration and 50th in voter turnout, Tennessee has more than 838,000 adults who aren’t registered. Having increased Nashville high schoolers’ registration by 85 percent in 2015, Cooper and Dickerson want to raise voter registration in the work force. Cooper and Dickerson announced Project Register in Nashville’s main library. “The 75 employers here today represent some 125,000 primarily Middle Tennessee employees, but we want all Tennesseans … to participate,” Cooper said. Project Register participants are to tell new employees about on-line voter registration at https://ovr.govote.tn.gov/Registration/#BM. Before Alabama’s election, McClatchy, America’s second largest news business, reported black voters could defeat Roy Moore if they show up to vote. Jones’ election was buoyed by African Americans. “The way you show your distain with the party in power is to cast a vote for the other party,” Harris said. Only Texas has lower voter turnout than Tennessee. Washington, D.C. residents vote more than both those states. 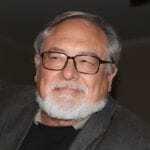 “It’s always surprised me … how little involved the public is in politics and seeing … the voter registration numbers shocked me,” Bongo [Java] Productions Founder Bob Bernstein said. Tennessee’s population is growing and voter participation is declining, according to Tennessee’s Secretary of State and the U.S. Election Project. “Money is not black and white; money is not red or blue. Money is green,” says Alan S. Young, president of Nashville’s chapter of the Entrepreneurs Organization. “Voting and getting our members and employees out to vote is important for everybody in business.” EO member businesses employ more than 10,000 people in 200 companies. Tennessee is the 37th state to offer voter registration on-line.